Gallery 1988 have a new literary inspired Required Reading exhibition opening tomorrow at their West gallery in Los Angeles and I've contributed a new two colour screen print. 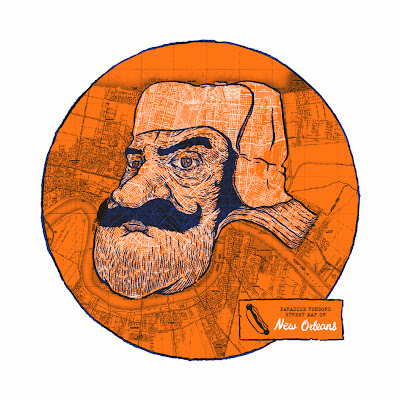 I've tweaked the illustration I did for a Miles To Go t-shirt inspired by John Kennedy Toole's wonderful 'A Confederacy of Dunces' and made it into a two colour screen print titled 'Paradise Vendors Street Map of New Orleans'. The print edition is forty measuring 42cm by 42cm and I've got a few held back to sell in my shop when the exhibition ends. I've just tried to find a bit more info about the show and was a little concerned to see the artwork used for the flyer has some uncanny resemblences to my print - both feature a hunting cap with the pattern of a city map on them - I'm pretty sure it's just an unusual coincidence but even so it's a bit odd! More info here.